The objective of the BIMSTEC Transport Infrastructure and Logistics Action Plan 2014–2020 is to provide a "road map" to enhanced regional transport development based on improved connectivity, particularly to support growth in intra-regional trade. Firstly, it is designed to highlight the key BIMSTEC program developments and their respective scheduling, tracking progress in the implementation of regional transport infrastructure and logistics projects. Secondly, it can act as a simple monitoring mechanism, so that the BIMSTEC Secretariat and/or its technical support resources can easily measure the implementation of the agreed policies and strategies on a regular basis. It is recognized BIMSTEC is neither a funding nor implementation agency and therefore its influence over the execution of the overall plan may be limited. Nonetheless, as a regional "pressure group" with increasing influence, BIMSTEC may be able to persuade the "Member States" to prioritize projects which have been delayed and/or to promote the early implementation or completion of others. 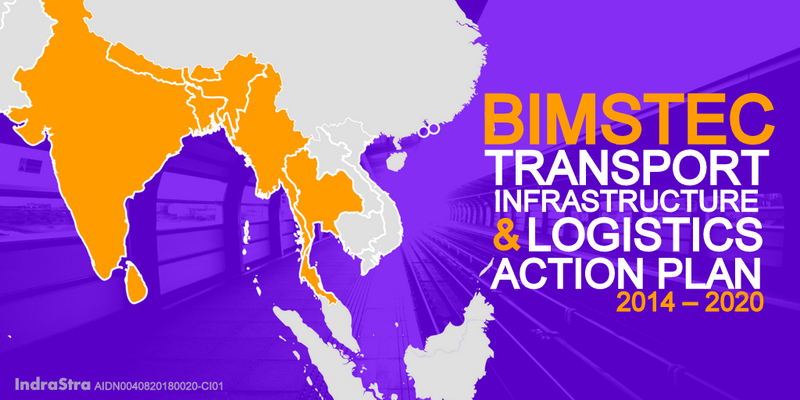 To be able to exert influence in the transport sector, it is important that BIMSTEC has an established plan and is able to collect relevant data to identify progress in the implementation of that plan. The BIMSTEC Transport Infrastructure and Logistics Action Plan 2014–2020 (shown in Table 8, Updating and Enhancement of the BIMSTEC Transport Infrastructure and Logistic Study/ Final Report/ July 2018, pp. 23-26) comprises a list of these policy and strategy indicators, together with their projected implementation timescales. This will allow the BIMSTEC Secretariat to use the plan to highlight the undertaking and completion of various projects to be able to demonstrate and publicize policy progress. The majority of these projects are scheduled for completion between 2014 and 2018, including some short-term projects capable of demonstrating the achievement of some early goals. However, it is realized with projects of this complexity and cost that some "slippage" is almost inevitable, thus the emphasis on projects expected to be completed within the plan’s time frame even allowing for such slippage. It is important to appreciate that the plan should remain a "live" document. As projects are completed, they should be replaced with other relevant projects, probably from the long list, though it is recognized that during the plan’s implementation period, new projects and emphasis may arise. The plan should be seen as a rolling implementation program, thus the need for regular monitoring of projects within the plan. The difficulties in implementing the BIMSTEC Transport Infrastructure and Logistics Plan 2014–2020 should not be underestimated. The cost of implementing the long list of BIMSTEC projects is estimated at US$45 billion–US$50 billion, of which only approximately US$18 billion, or less than 40%, has been identified as having indicative funding sources. The implementation cost of the new projects on the plan’s short list of priority projects is estimated to be about US$15 billion, of which approximately $8 billion, or just over 50%, has provisional allocated funding from the government, donor, or private sources. Consequently, the risk of implementation delays due to funding shortfalls is still significant. In addition, some of the ongoing projects are being undertaken in stages, and indications are that sufficient funding to complete all of the phases may not have been allocated at this stage. This article is an excerpt taken from an "open access" report published by Asian Development Bank (ADB), under the title - "Updating and Enhancement of the BIMSTEC Transport Infrastructure and Logistic Study/ Final Report (July 2018)". ISBN 978-92-9261-168-2 (print), 978-92-9261-169-9 (electronic). DOI: http://dx.doi.org/10.22617/RPT157680-2 The report has been made available by the original publisher under the Creative Commons Attribution 3.0 IGO license (CC BY 3.0 IGO).